This is about my truck. I'm not apart of any Cummins forums so I figured I'd ask here. Two nights ago my rim broke where the outside changes to the inside of the rim. Just below where the bead seats. I wasn't able to over correct it quick enough to keep me from hitting the front bumper against the rocks but kept the truck from getting completely pitted. It wedged into the rock wall and the short ditch. My snowmobile flew out of the truck but was luckily undamaged. Appears that when I hit the mtn a rock piece broke free cause something hit down on my bed cap and crushed a portion of my bed. Airbag light was on but no airbags went off. Read window blew out. Cab is smashed in along with the rear door, and obviously the front tire area is pretty messed up including the front bumper and fender. I hit my face on the steering wheel but other than a sore back, hurt wrist, and bloody nose I'm mostly unscathed. So that's a decent summary of events, my question is, should I pursue Dodge making this right or just file an insurance claim and let the insurance company go after dodge? I'd rather not have my rates go up if Dodge can just handle it. Sorry to hear that and I'm glad you are OK.
To play devils advocate: "What makes you think that it's Dodges fault?" Glad to hear you are OK. Some more vehicle details would be helpful. I also don’t see a angle on this were it ends up in Dodge’s lap. Where you on your way home from the dealership directly after you purchased it brand new when this happen? Rims and tires are considered wear items and are only SOMETIMES covered within a specified period of time, less than 5k miles from new as a example, this can vary by brand and issue. I really don’t envision Dodge helping you out on this. Good luck and let us know how you make out. 2017 SS M6 LSA Kooks LT & Mids Crane Cam ID1050 2.55"
How are rims considered wear items? Stock wheels and stock suspension. Truck is just under 2 years old. I don't think rims should shear in half. The problem you have is how do you determined that it's a manufacturing defect and not damage from your use? I can't seem to upload a picture. Just switched from windows to MacBook and aren't familiar with this new file type for my pictures but the forum says invalid file. I mean worst case scenario I file an insurance claim. The bed is destroyed, looks like a rock came loose from the mtn and fell down crushing the bed rail down. The airbag light is on but no bags deployed so not sure if the system needs maintenance or just to be reset, my wheels are pointed straight but my steering wheel is pointed 90* left, and my traction control is freaking out. So all that along with the extensive body damage will be pretty **** spendy. 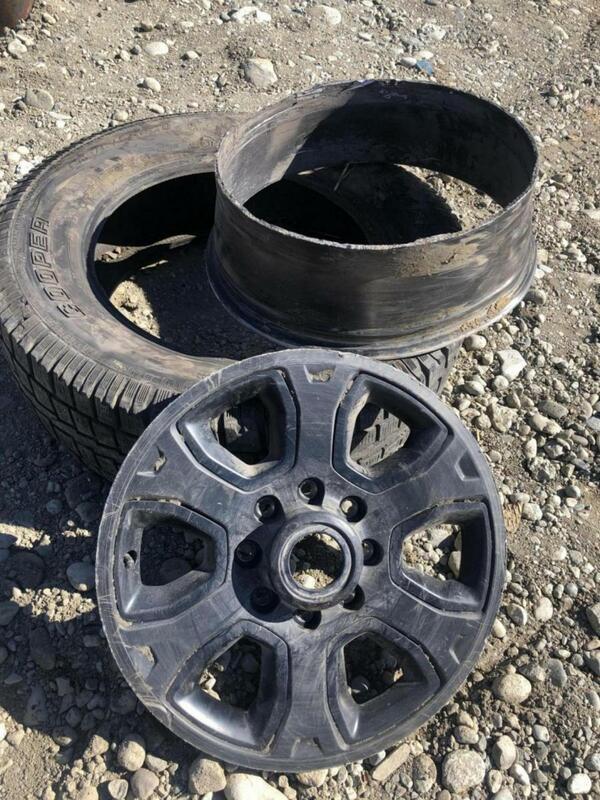 Rims are the second in line to help absorb all of the driving you do, every bump and pothole goes through a rim. Warranties cover manufacting defects, its almost impossible to prove that a rim failed from a manufacturing defect 2 years out, its much more likely from the stresses of its environment. Let’s say they would cover your rim. From your description that side of the truck impacted the cliff. Correct? Now they can simply say the observed damage of the broken rim is from the impact. It would be much different if you found the cracked rim while the truck was parked in your driveway for you file a warranty claim. It would still be unlikely to be covered 2 years out. Does your truck have TPMS? It should have let you know pressure was getting low. I’m not here to make you upset, you asked for opinions, this is mine. I see what you are saying, I don't know that there was a crack, not sure how I could prove that. I guess I don't really care if there was a crack or not. A rim shearing seems dangerous as ****. If it had been the other side and I hit a family that was killed I'm pretty sure they would be going after the manufacturer. Could you post a close up of the crack fracture?